Below are some of my favorite "Hunter" style blades. No huge choppers here, just the size you need for light carry and to get the job done. Spear-point Hunter in "Raindrop & Redwood"
This hidden-tang Hunter is forged from 400 plus layers of three types of high carbon steel done in a "Raindrop" pattern. The handle is A-grade, stabilized Redwood Burl with throat of African Blackwood. The contoured guard, spacer and set pin are all stainless steel. This Spear-point blade is 5 7/8", the overall length of this knife is 11 1/8". This knife comes with a tooled leather pouch sheath with snake-skin inlay and a belt loop and retention strap. 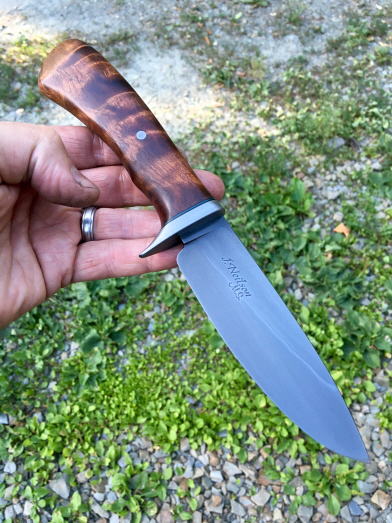 This full-tang Hunter has a sharp/tough edge and a very different look, my kind of knife (made and as seen in my "Tips & Tricks" DVD). This edge quenched blade is forged from 1080 high carbon steel and has my "antiqued" finish, lightened with vinegar to bring out the hamon/quench line. The handle scales are "Black Shrapnel"... a composite with aluminum shavings in the mix and are done in a "palm swell' style, secured with stainless steel handle bolts. The pommel end of the knife also has an exposed lanyard hole and has a matching fancy lanyard fob by Jodi Johnson. This piece has a 4 3/8" cutting edge and an overall length of 9 1/8". 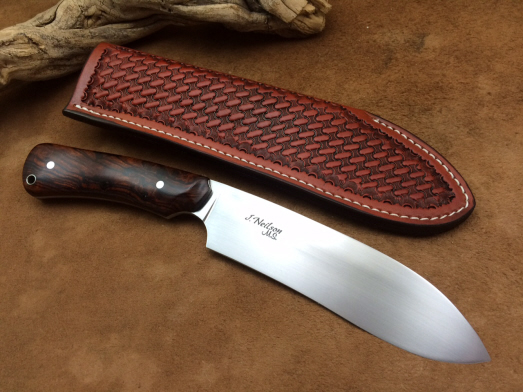 This knife comes with a tooled leather pouch sheath with a belt loop. This straight forward, full-tang Clip-point Hunter is forged from Cru-forge V high carbon steel and edge quenched. The blade has forged marked and acid/soaked flats and then my "antiqued" finish all the way around for corrosion resistance as well and a unique look. The handle scales on this knife are stabilized Presentation-grade Rosewood Burl done in a "palm swell" style and secured with two stainless steel handle bolts and a matching lanyard liner. This piece has a 5 1/2" cutting edge and an overall length of 10 1/2". The knife comes with a tooled leather blade sheath with belt loop and retention strap. This full-tang Hunter has a recurve blade, with a cutting edge just over 6", forged from 5160 high carbon spring steel. The blade has a hand-rubbed finish and the tang is handled with scales of A-grade Desert Ironwood Burl done in a "palm swell" style. The handle scales are secured with stainless steel handle bolts and also have a matching lanyard liner. 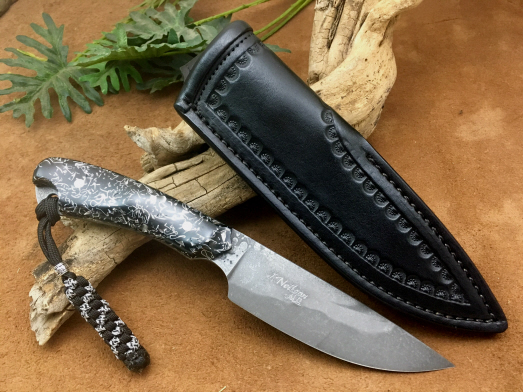 The overall length on this knife is 11 1/4" and it comes with a fully tooled leather "pouch" sheath with a belt loop and "dangler" ring. This combination knife can be used as a Hunter/skinner, hold her towards the back for chopping strokes, choke up on the modified ricasso for finer cuts... this really is a knife made for multiple tasks. This "MTK" is forged from edge-quenched 52100 high carbon steel with a hand rubbed finish, checkered spine and rounded choil. The knife has an overall length of 12 1/2" with a 6 1/2" cutting edge. The finger slotted, full-tang handle has stabilized Giraffe bone handle scales that are secured with three stainless steel handle bolts. 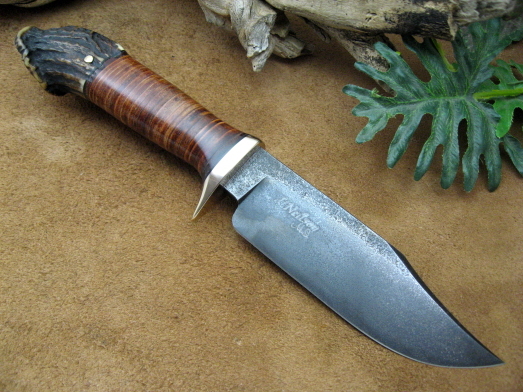 This knife also comes with a "holster" style pouch sheath, with a belt loop. This new Hunter has the look that would fit wonderfully on a saddle or gun belt. This piece has a 7 3/8" blade, with a straight back and slightly swept tip, forged in a "forced random" pattern damascus. The S-guard is forged from carbon steel with accent filed tips and has an "antiqued" finish. The handle is a Sambar Stag crown with a 2 piece, hammered copper "collar" and hammered copper pin work accents on the brow side. The handle is finished off with a hammered and etched carbon steel set pin. The overall length of this piece is 13 1/4" and comes with a fully tooled leather blade sheath with belt loop and retention strap. 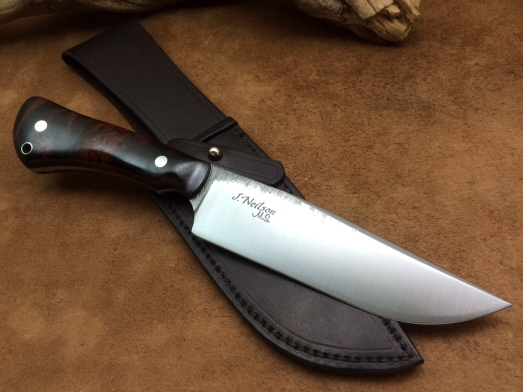 This new "Woodsman's Knife" is a hidden-tang Clip-point Hunter forged from Cru-forge V high carbon steel. The blade is 5 1/4" and has forge-marked and acid soaked flats as well as my "antiqued" finish and the flats and bevels. The contoured guard is silica bronze with a matching hammered set pin in the handle. The handle itself is pressed and stacked leather with a Sambar Stag crown pommel end and thin black G-10 spacers on either side of the leather. The leather and rear spacer have been filed to match the stag. The overall length on this piece is 10 3/4" and the knife comes with a fully tooled leather blade sheath with belt loop, retention strap and inlay work. This one is named after the Peregrine Falcon because it is very light & fast, almost a small Fighter but, also the perfect size for a Hunter style. This full-tang knife is forged from high carbon damascus steel done in a "feather" pattern with a 5 1/8" cutting edge and has a file worked thumb rest. 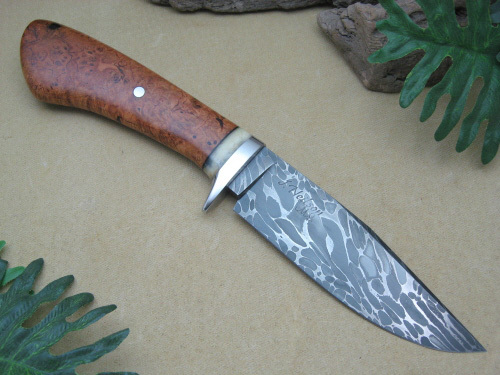 The handle scales are Desert Ironwood Burl done in a "palm swell" style with beveled edges. The handle scales are secured with stainless steel handle bolts. The overall length of this knife is just a hair under 10" and comes with a border tooled leather pouch sheath with belt loop. This is the new, updated version of an old favorite and a true work horse, with a cool look. 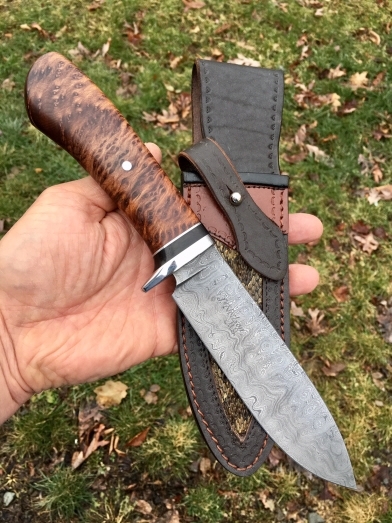 This full-tang hunter is made from my "ball-bearing" high carbon damascus forged from 52100 ball-bearings and 1095 powder done in a canister weld. This style hunter has an integral guard, thumb drop (for extra control) and an open/exposed pommel with lanyard hole. The knife is 8 7/8" overall with a 4 1/8" cutting edge. 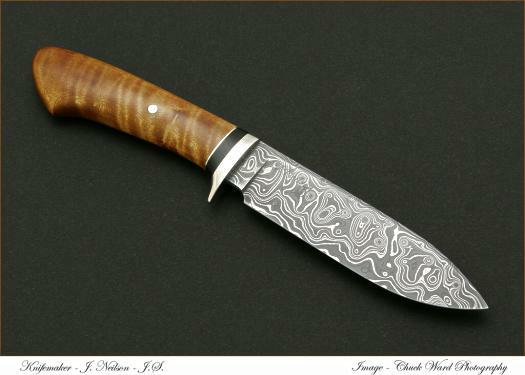 The knife is has forge marked and acid soaked flats to contrast the etched damascus. The handle scales are top grade, stabilized Redwood Burl wood secured with stainless steel handle bolts. The knife comes with a tooled leather pouch sheath with belt loop. This pair of full-tang Hunters will cover a lot of bases. The larger, "main knife" of the set is forged from 52100 high carbon steel and has my "antiqued" finish for ease of maintenance and no-shine qualities. The knife is 10 1/4" overall with a 5 1/8" cutting edge. The handle scales are multi-dyed and stabilized A-grade burl wood done in a "palm swell" style. The handle has a "coffin" profile and is secured with two stainless steel handle bolts and a matching lanyard liner. The smaller "side knife" matches the larger knife in all ways except it is forged from 1084 high carbon steel, everything else mimics the larger knife including the handle scales coming from the same block of wood. This smaller one has an overall length of 7 1/4" and a 3 3/8" cutting edge. The fixed "piggy back" sheath is fully textured in two-tone leather with a belt loop and the blades are secured in the sheath with rare earth magnets as well as the fit. Here is a twist on a classic design. This Nessmuk-style knife has a differentially hardened blade forged from 5160 high carbon spring steel and the blade has my full "antiqued" finish. The handle is stabilized and double dyed Red and Black Box Elder Burl and has a contoured guard, pin and lanyard liner of stainless steel. The knife is 10" aol with the blade and handle split approx. evenly (5" blade/5" handle). 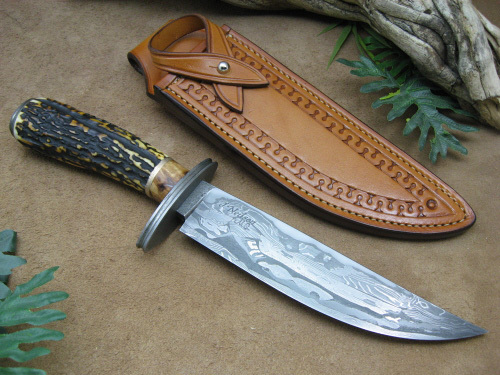 This knife is shown with a fully tooled/texture leather sheath with a belt loop, retention strap and fire steel loop. This hidden tang Hunter is the one I built in my recently released "Tips & Tricks with J. Neilson" instructional DVD to demonstrate how I build a hidden tang knife with the added difficulty of a mechanical joint to accept a handle with a natural curve and a fully threaded/structurally secure pommel to make all parts of this knife "one solid piece", as well as other aspects of the process I use. The 4 3/4" blade of this knife is forged from 1080 high carbon steel and has a 4 3/8" cutting edge. The blade also has a hand-rubbed and etched finish to bring out the hamon/quench line. The handle of this piece is sealed, top-grade Sambar Stag with a "trigger" guard and fully threaded pommel (worked/filed to match the stag) of low carbon steel, etched to match the blade. The overall length of this piece is 9 1/2" and it comes with a tooled leather blade sheath with a belt loop and retention strap. These hidden tang Clip-point knives are both forged from Cruforge-V high carbon steel with my "antiqued" finish for a tough, low maintenance blade that resists the elements. 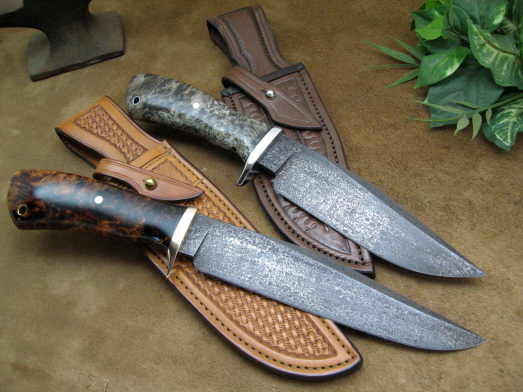 The "Fire" version (bottom) has a 6 5/8" cutting edge and an overall length just over 12". The guard, pin and lanyard liner are all silica bronze the the handle is stabilized and multi-dyed (reds & oranges) A-grade Maple Burl wood. The "Ice" version (top) has a 5 1/2" cutting edge and an overall length of 11 1/4". The guard, pin and lanyard liner are all stainless steel and the handle is stabilized and multi-dyed (whites & greys) A-grade Maple Burl wood. 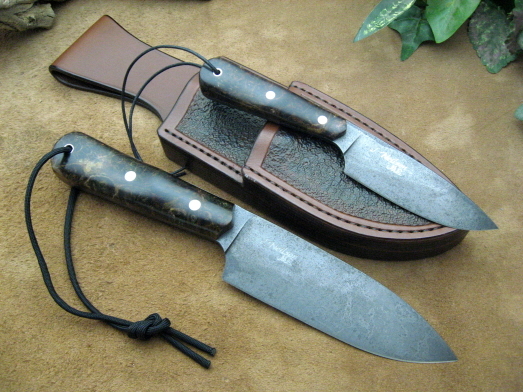 Both knives come with tooled leather sheaths with belt loops and retention straps. 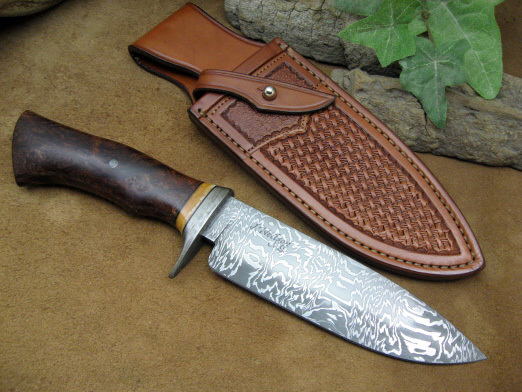 This spear-point style Hunter has a 5 7/8" blade of high carbon "W" pattern damascus steel, edge-quenched and with a visible hamon. The contoured guard is done in "jail bar" wrought iron. The handle is stabilized, top- grade Redwood Burl with a throat of stabilized Giraffe bone with a black spacer and is finished off with an etched, carbon steel pin. The overall length of this knife is 11" and it comes with a tooled leather blade sheath with belt loop and retention strap. This full-tang knife is forged from 52100 high carbon ball-bearing steel with forge marked/acid soaked flats and satin finished bevels. The knife has a 5 1/8" cutting edge and has a "jimped" thumb rest. 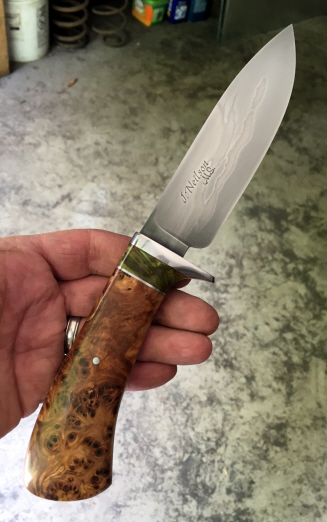 The handle scales are Desert Ironwood Burl done in a "palm swell" style. The handle scales are secured with stainless steel handle bolts and matching lanyard liner. The overall length of this knife is just a hair under 10" and comes with a leather blade sheath with belt loop and retention strap. 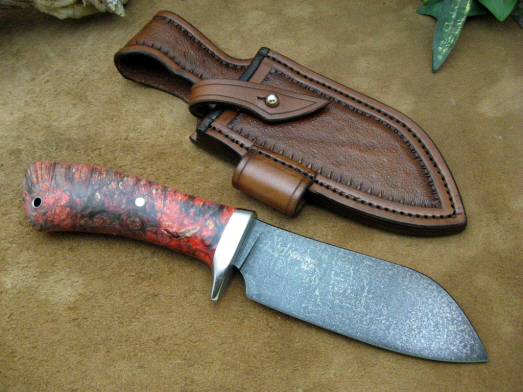 This full tang Hunter is the one I built in my recently released "Basic Hunters with J. Neilson" instructional DVD. This knife's 4 1/2" cutting edge has my flat ground/convex edge design as well as a satin finish in 1084 high carbon steel. The tang of the knife is slightly tapered (to lighten it overall) and has handle scales of stabilized Spalted Hawaiian Koa wood. The scales are done in a "palm swell" style, for grip and comfort, and are secured with stainless steel handle bolts. The overall length of this knife is 9 1/4" and it comes with a border tooled leather pouch sheath with a belt loop. 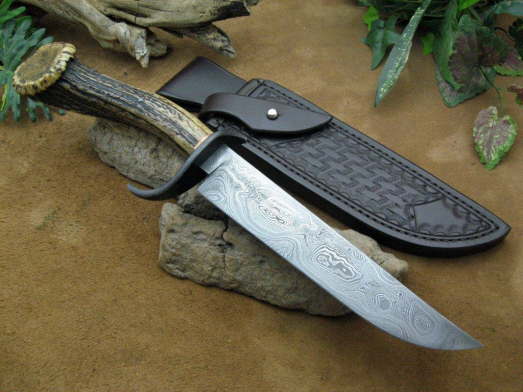 This Hunter has a wide 7" blade of folded, 52100 & 1084 powder high carbon "ball-bearing" damascus steel with a file worked spine and gut-hook. The fullered oval guard and pommel are both "ball-bearing" damascus as well. The handle is stabilized/grey dyed Maple Burl wood with spacers of 1018 & nickle "twist" damascus with a fullered red Micarta spacer in between and a matching pin. 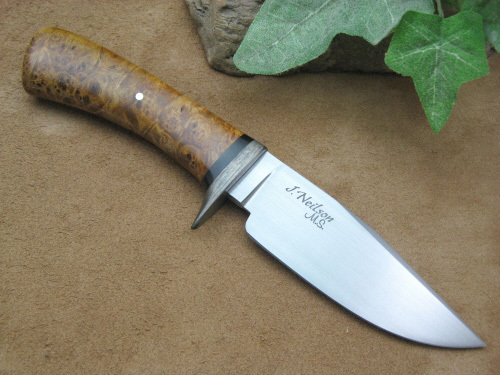 This knife is 12 1/4" overall and comes with a tooled leather blade sheath. 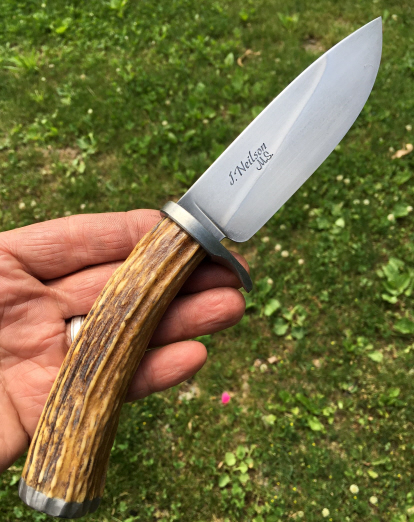 This hidden tang Hunter is the one I built in my recently released "Advanced Hunters with J. Neilson" instructional DVD to demonstrate how I build a hidden tang knife with a guard, as well as other aspects of the process I use. 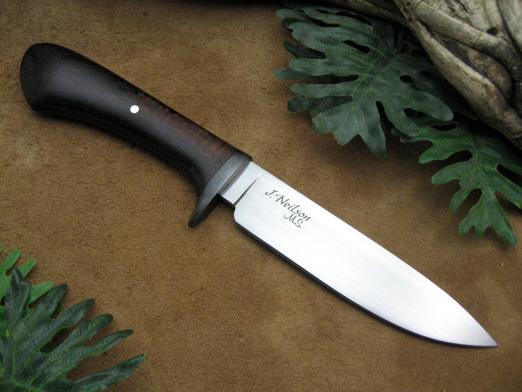 The 5" blade of this knife is forged from 1080 high carbon steel and has a 4 5/8" cutting edge. The blade also has a hand-rubbed and etched finish to bring out the hamon/quench line. The handle of this piece is stabilized Quilted Redwood with a contoured guard and set pin of low carbon steel, etched to match the blade and green/black G-10 spacers. The overall length of this piece is 10" and it comes with a tooled leather blade sheath with a belt loop and retention strap. 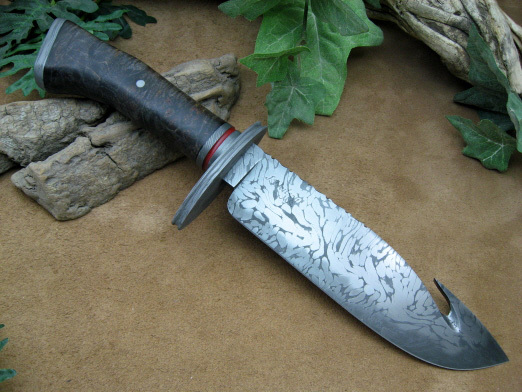 This Trailing-point Hunter has a 6 3/4" blade forged of high carbon "frontier" damascus steel with etched and forge marked flats. The fullered oval guard and pommel are both etched wrought iron. The handle is Sambar stag with a throat of stabilized Eucalyptus Burl wood and a spacer of worked silica bronze. The pommel is threaded into the tang of the knife. 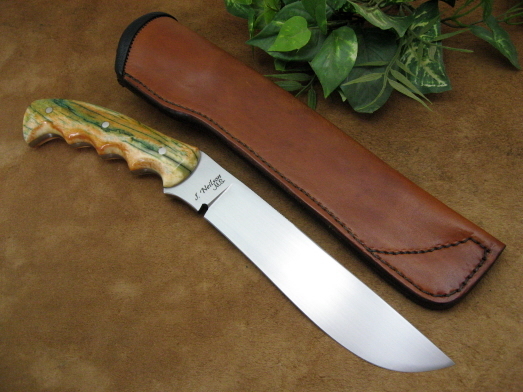 The overall length of this piece is 11 5/8" and comes with a tooled leather blade sheath. This Clip-point hunter has a 4 3/4" blade of "B-B Smash" damascus forged from 52100 ball bearings. The contoured guard is stainless steel as well as the handle pin. The handle itself is stabilized, A-grade Cherry Burl wood with a black spacer and a throat of stabilized Giraffe bone. 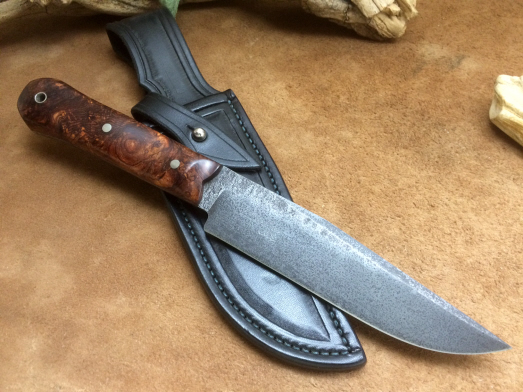 The knife is 9 1/2" overall and comes with a fully tooled leather pouch sheath. This "bird & trout style" Small Game knife is forged from 1084 high carbon steel, edge-quenched with a file-worked thumb rest and a hand rubbed finish. The handle scales are stabilized California Buckeye Burl wood with stainless steel handle bolts and an exposed lanyard/pommel opening. 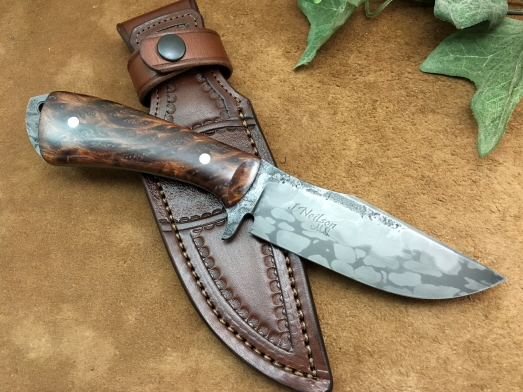 This knife is 8 3/8" overall with a 3 5/8" cutting edge and comes with a tooled leather pouch sheath. This Clip Point Hunter has a 4 1/8" blade of 5160 high carbon steel with a hand-rubbed finish. The contoured guard is "wagon wheel" wrought iron. The handle is Maple Burl wood with a throat of black Buffalo horn (both are stabilized) and finished off with a stainless steel pin. 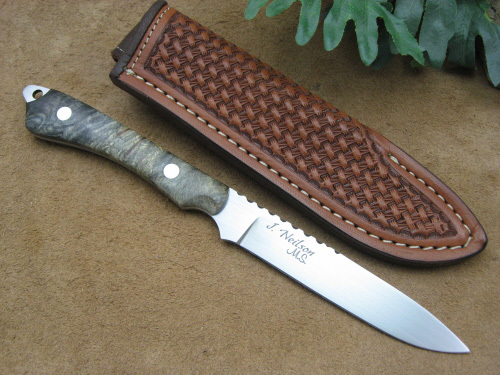 The knife has an overall length of 8 3/8" and comes with a fully tooled leather pouch sheath. This Spear Point Hunter has a 5 3/4 blade of 300 layer "raindrop" pattern high carbon damascus steel (approx. 3/16'' at thickest). The guard is nickle-silver. The handle is stabilized Curly Maple wood with a throat of African Blackwood and a nickle-silver spacer. The handle is finished off with a stainless steel pin. The knife has an overall length of 10 3/4". The knife comes with a fully tooled leather blade sheath with a belt loop and retention strap. 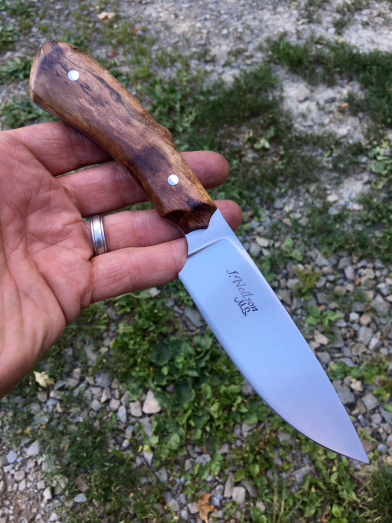 This hidden tang Hunter is the one I built in my recently released "Tips & Tricks with J. Neilson" instructional DVD to demonstrate how sometimes, even with all your plans, a "hamon" (or quench line) can do very unexpected things and how to etch and bring out that beauty, as well as other aspects of the process I use. The 4 3/4" blade of this knife is forged from 1080 high carbon steel and has a 4 3/8" cutting edge. The blade also has a hand-rubbed and etched finish to bring out the wavy/cloudy hamon or quench line on this blade. The handle of this piece is stabilized Elm Burl with a throat of stabilized and green dyed Box Elder Burl. The contoured guard, spacer and set pin are all of stainless steel. The overall length of this piece is 9 1/2" and it comes with a tooled leather pouch sheath with a belt loop. This Spear Point hunter has a 5" clay-quenched blade forged from 52100 high carbon steel with a full distal taper, hand-rubbed finish. The knife is 10" overall. The contoured guard is lightly-blued 1018 carbon steel. The handle is A-grade Curly Koa wood with a black spacer and stainless steel pin. The knife comes with a tooled leather pouch sheath with a belt loop.